View the current status, time in the status, duration since logged in, time spent processing interactions, and more. Access real-time agent status graphs indicating the percentage of time in various states, such as on call, waiting, wrap up, on break, and more. 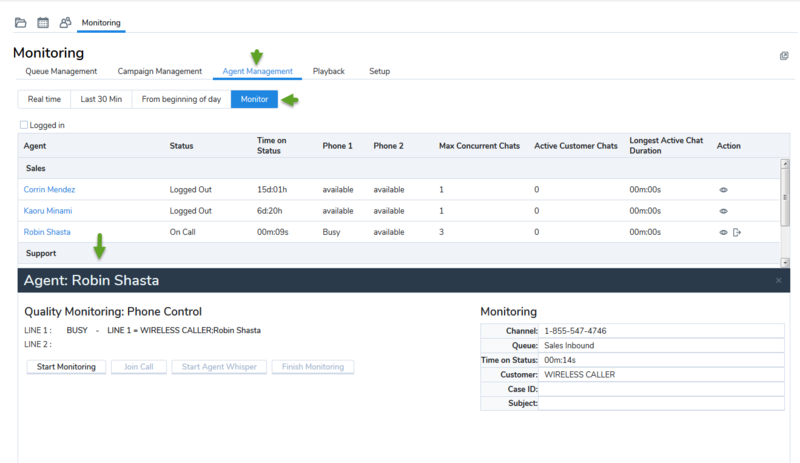 Monitor live agent and customer interactions by barging into calls. Monitor agent performance by accessing the audio recordings of the agent's phone interactions. Time Zone Select from available time zones when monitoring queues and agents as a supervisor. The Time Zone appears under From beginning of day only. Agent Lists all the agents monitored by you. Current Status Current status of agents. Status Code Status code indicating the reason for current status. For example: Working offline to wrap up case work. Available if your contact center subscribes to status codes. Time on Status The duration in the current status. Phone Line 1 Shows if an agent is on the live call on Phone line 1. Phone Line 2 Shows if an agent is on the live call on Phone line 1. Active Queues Number of queues an agent is active. Last Login The time at which an agent logged in. Shown in tenant time zone. Total Time Login Total duration of login since the beginning of the day by tenant time zone. Total Time Transaction Total time spent on handling interactions. Maximum Concurrent Chats Shows the maximum concurrent chats allowed for an agent. Active Customer Chats Shows the number of active chats for an agent. Log in to the SupervisorAn agent with the supplementary privileges required to create FAQ categories and answers, monitor agent interactions in progress, listen to recordings of previous interactions, and create reports for the agents groups they supervise. Console as a supervisor. Only supervisor accounts can access the Supervisor Console monitoring features. From the Control Panel menu, click Monitoring. If configured by your administrator, the Monitoring tab also appears along with other Local CRM tabs. Note: Supervisors can open the Monitoring window in a separate pop-up window. Click on top-right corner of the Supervisor Console Monitoring window for the pop-up window to open. To go back to the Monitoring window inside Supervisor Console, click again. Click the Agent Management tab. The Supervisor Console lists the groups you selected in the Setup tab. To begin monitoring, click Monitor in the header area. For agents on live calls, is enabled under the Action column. Select an agent you wish to monitor and click under the Action column. Click an agent's name to view the monitoring controls. Accept the call to listen in. To end monitoring the call, click Finish Monitoring. To participate in the call, click Join Call. End the call when done. -The monitoring data is updated even when the supervisor status is Break. -The last monitoring configuration before the supervisor logs out is saved and presented when they log back in.